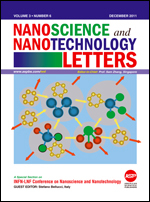 Nanoscience and Nanotechnology Letters (NNL) is a multidisciplinary peer-reviewed journal consolidating nanoscale fundamental and applied research activities in all disciplines of science, engineering and medicine to publish original short research articles as communications and letters of important new scientific and technological findings. The topics include synthesis, fabrication, processing, characterization, properties, and applications of all kinds of nanostructured functional materials. PLEASE READ THIS NOTE BEFORE SUBMISSION: Manuscript processing fees of US$ 650 per article for all Countries. Please read "Instructions for Authors" for more details. Hereafter, online submission to the journal is assumed that authors fully agree to pay US$ 650 manuscript processing fees for articles upon acceptance.